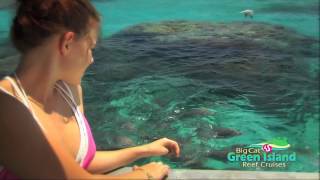 Get the best service and rates by dealing direct with Big Cat Green Island Reef Cruises. M.V. Crocodile Explorer is a comfortable, air-conditioned vessel taking small numbers of visitors along Trinity Inlet on this scenic two hour nature cruise. With waterways winding through a 300 square kilometre maze of mangroves, expect rich diverse wildlife, stunning scenery and a relaxing cruise with informative commentary from our crew. This is the saltwater crocodile’s natural habitat – with a chance to spot them basking on the muddy banks particularly in the cooler months. Times: Daily at 1.30pm for a 2 hour cruise. Our Cairns evening sunset cruise tour rates as one of the top ten things to do in Cairns and is sure to be an unforgettable evening. Picture yourself relaxing on a sunset cruise in Cairns, standing on the deck with a drink in hand, the breeze blowing through your hair with the sun setting over Cairns’ lush mountains throwing out a glorious mix of colours into the sky above. 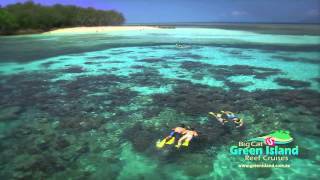 The Green Island ferry half day tours allow you to enjoy the beauty of Green Island when short on time or simply want to get to the reef for a couple of hours. Choose to snorkel, dive, stay dry or view the spectacular underwater reefs in our semi submarine or glass bottom boat, or simply laze on the white sandy beach. 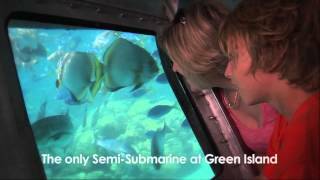 These are only a few of the many reef and island activities available at Green Island. Our friendly crew will help you to organise your activities to make the most of your time. Green Island, a Marine National Park is a beautiful coral cay on Australia’s Great Barrier Reef. Green Island boasts unique rainforests, surrounded by white sandy beaches and magnificent coral reefs and abundant marine life. Departs Cairns at 9.00am allows 2 hours on Green Island and arrives back in Cairns at 12.45pm. Departs Cairns at 1.00pm allows 2 hours on Green Island and arrives back in Cairns at 5.00pm. “Reef Rocket” is a modern comfortable air-conditioned high speed catamaran with a relaxed atmosphere. Travel time to Green Island is 45 minutes from Cairns. 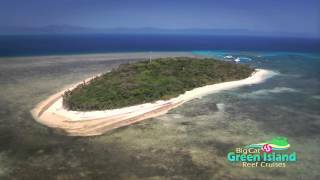 Green Island is a beautiful coral cay on Australia's Great Barrier Reef. Green Island is a Marine National Park with unique rainforests, surrounded by white sandy beaches and magnificent coral reefs and abundant marine life. Big Cat offers a range of packages with a choice of full day or half day cruises. 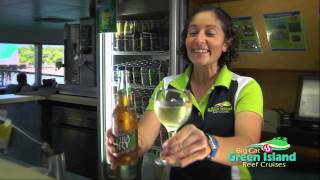 Big Cat operates daily from Cairns, in Tropical North Queensland, at 9am, 11am & 1pm. 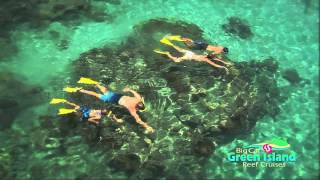 Big Cat Green Island Reef Cruises is a family owned reef cruise company with over 20 years of experience in offering cruises to the Great Barrier Reef. Big Cat Green Island Reef Cruises are the winners of the 2004, 2006 & 2007 Tourism Award in Tropical North Queensland for best Tour & Transport Operator and was inducted into the TTNQ hall of fame in 2008. Also offering day tours that combine a cruise to Green Island with anther popular tour; Skyrail, Kuranda Scenic Rail, Ballooning, Rafting, Cairns Harbour Cruises, Dome & Zoom, Dundees, City Sights tour, ATV's and Horseriding. Awesome day on a tropical island! This was an amazing trip - all the staff were very nice and helpful :) The water was crystal clear and we saw sooo many turtles! Just paradise! Lunch was excellent - be sure to pre-pay it - it's cheaper Done certified diving as well - was one of my favourites at the Great Barrier Reef :) We were very sad to leave! If you love islands, warm & clear waters and TURTLES - then definitely do it ! My family went on the Big Cat yesterday to Green Island. We can not speak highly enough of the crew! My children loved it, the highlight for my daughter was being able to throw the food over to feed the fish. Our youngest is 2 and the staff - especially Angela - went out of their way to ensure he was comfortable- especially when he was asleep. We will be recommending them to our friends. Thanks for a great day. Did the full day trip with buffet lunch, snorkelling gear and glass bottom boat. Had one of the most amazing and relaxing days! Can not speak more highly of the crew - nothing was too hard, they were ready for anything and more than happy to help. The snorkelling was an amazing experience and the island was such a beautiful place. Buffet lunch was perfect for the activities and it was well organised so that you had time to experience everything. Could not speak more highly of this experience. Kudos to this company - AMAZING! !